First of all, to be clear, I’m not talking about this blunder (video), where Matt Kemp was picked off by Brian Fuentes in the 9th inning of last night’s game between the Dodgers and the Angels – I’ll cover that one later today. Instead, I’m talking about the tandem gaffe between Russell Martin and Reed Johnson. On a base hit by Jamey Caroll, Russell Martin was thrown out at second to end the game before Johnson, starting at second, managed to cross home plate to score the tying run. Check out the video here. Let’s diagram this play and try and get an idea of exactly what happened. This is the first shot from behind home plate in which we can see Reed Johnson. This comes roughly 1.45 seconds after the point of contact. Johnson was off on contact with two outs. There’s going to be quite a few more images here; if you’re interested in tracking this play, follow the jump! Here’s a bird’s eye view of the play at this time. Johnson (J) is already nearly halfway to third and is picking up steam. Martin (M) is off screen but on his way to second. Carroll (C) is now out of the box. Let’s pick it up a couple of seconds later, at the 3.5 mark. This is the last shot in which we can see Johnson from this angle, and it comes right as he is preparing to round third base. Martin is still off screen but approaching second base. Carroll is coming up on first. Johnson is going to score easily – he’s already at third before Juan Rivera in left field even picks up the ball (highlighted). 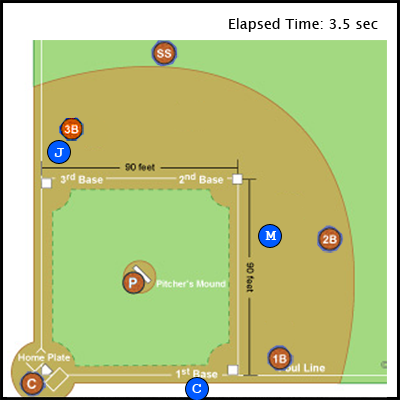 If there is a tag for the third out made before the runner touches the plate, however, the run doesn’t count. Here’s Johnson roughly 6.4 seconds into the play. And a few frames later – I have it at 7.2 seconds after contact – Martin is out. It certainly appears to me that Johnson could not have touched home plate before the tag was applied to Martin. 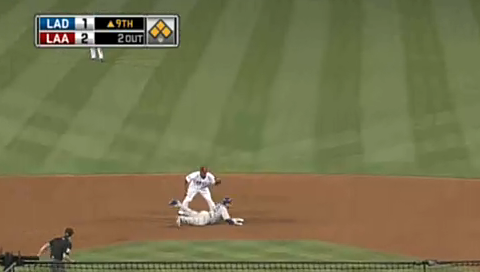 The play at second base was close, but it looked to me as if the tag beat Martin back to second. For the sake of argument, let’s assume that the play at second was called correctly – that’s a debate for another time and place. 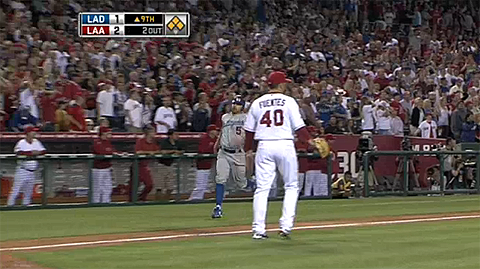 With Martin expecting a throw home, he was rounding second in the event of a poor throw. But advancing to third base would be nearly meaningless with two outs. Martin needed to realize where the fielders were and where the ball was, as the turn he took was completely unnecessary and especially reckless if he was unaware of the location of the ball. Still, it wouldn’t matter if Reed Johnson had simply ran his hardest the whole way. It took him 3.6 seconds to reach third base. Given that he wasn’t at top speed until he was about halfway to third, if not farther, scoring in another 3.6 seconds isn’t unrealistic. We can clearly see in the video that he picks up his speed a little bit more than halfway between home and third. It is pretty simple to me – Reed Johnson just didn’t run it out, and if he had, the Dodgers might still be playing in Anaheim. 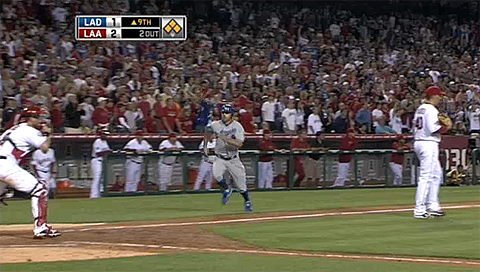 We hoped you liked reading The Baserunning Blunder In Anaheim by Jack Moore! I agree with everything said here and don’t even disagree about what was said about Martin, it was a dumb mistake. 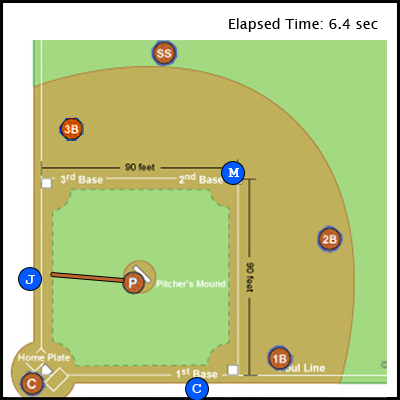 At the same time it is difficult to believe a few things: 1) that you can say a runner on third would be nearly meaningless with 2 outs since although the most important thing was to tie, in martins view they already had so the third run would be very big in the ninth and obviously more likely with a runner on third. 2) How did it possibly take martin 7 seconds to only get that far? had he stopped at second which seems to make more sense, because even he is not that slow and he was running on contact, then he had enough time to stop and realize the situation which makes this all worse. knowing that martin should’ve been running on contact, and that he had even more time to think about it does indeed make it worse. 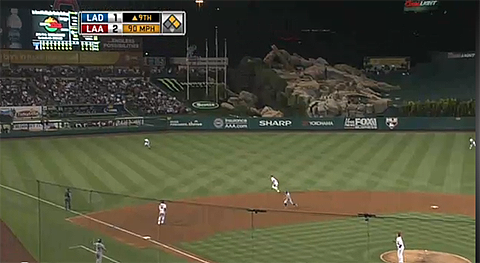 Pretty horrible baserunning by the dodgers all in one inning… wow. I agree that this is way off base. With a runner as slow as Martin, being at third would have been hugely valuable. He’s not fast enough where a single is going to assuredly score him. That doesn’t matter if the game is over. The key thing here is they were down one run. With one out? Sure, you want to draw a throw to let the run score. With two outs and a 90% chance Johnson scores to tie the game, running into the third out seems an indefensibly bad choice. Clearly, but the statement has nothing to do with that. The statement is that taking third in that situation is useless, when its clearly not. Running into the third out has nothing to do with the statement I was taking issue to. You’re arguing against a strawman. While you are right that making it to third with 2 outs is not useless, but it is not worth taking the risk in most situations. It’s one of those cardinal sins in baseball, that you don’t make the first or third out at third base. Martin essentially made the third out trying to go from first to third on a ball to left field. He would have been more likely to score later in the inning if he had just taken 2nd, than if he had gotten out, which he did. 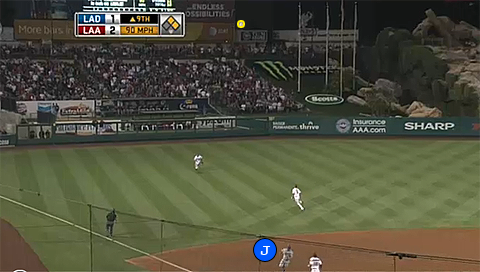 On the bloop hit, Johnson was going to score easily, so Rivera had no reason to attempt a throw home. Of course, many left fielders probably would have thrown home in that situation anyway, which is what Martin was probably banking on. Unfortunately for him, Rivera made a great heads-up play, throwing out the go-ahead run, with the added bonus that it happened before the tying run scored. Yes, it would have been better if Martin had made it to third than if he had been on second. But not much better. It is not worth taking the risk of making an out. Baserunners should only attempt that when they are sure that they will make it. A couple of huge baserunning blunders, combined with a very smart play by Rivera and Kendrick, gave the Angels the win. So it’s not totally meaningless, but certainly not worth risking the out there. And those numbers are nice when you’re talking about the league as a whole. They’re useless when you’re talking about a runner who isn’t league average. Chances are, the 1×3 number is similar for Martin, but the 12x number is much lower with a slower runner on second. Players are not faceless automatons. Some of them are fast, some are slow. Martin is slow. Expected runs per inning aren’t much different when you have 12- and 1-3 with 2 outs and Juan Pierre is your lead runner, but I’m going to go out on a limb and say that there is a relatively large disparity when Martin is. 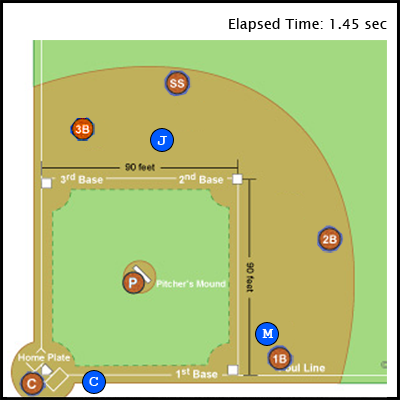 The expected run difference between a runner on second and a runner on third is very small with two outs. Oh, Jack beat me to it.